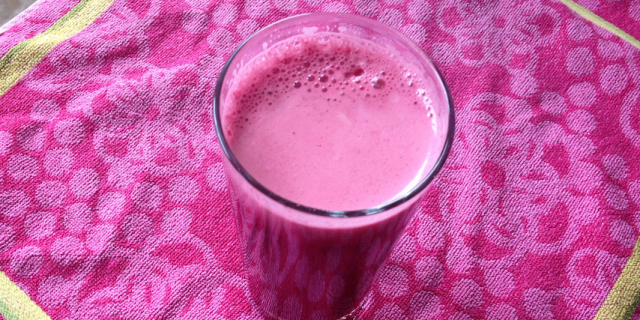 This Red Power Juice is super cleansing but not for the faint of heart. It contains beets, red cabbage, fennel and apples. Red power is the new green power. We tend to go for green juices but beets and red cabbage have so many outstanding benefits that we really don’t want to miss out on them in our diet. Beets are amazing. They have a strong, earthy taste, are amazing liver cleansers and chock-full of vitamins. They build up blood cells and stimulate the lymphatic system. Read here why a fresh beet a day is your lymph’s best friend. Red cabbage is great for juicing, and like beets, it has a somewhat bitter, earthy taste, but don’t let that keep you from enjoying its impressive health benefits. Red cabbage is truly one of the most nutritious vegetables around. It’s rich in antioxidants, boosts your immune system, has anti-inflammatory properties, supports the healing of the digestive tract and is named in the top list of cancer preventing foods. Read more of the health benefits of red cabbage here. As both the beets and red cabbage have such a strong taste I have added fennel and apple to balance it out. Fennel gives this juice a nice licorice flavor and the apples add some sweetness and freshness. Wash fruits and vegetables, juice and enjoy!